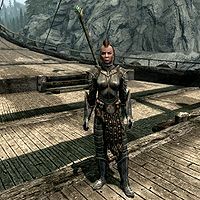 Sabine Nytte, a Breton warrior, is first mate aboard the Red Wave in Solitude harbor. She claims to be the only source for the illicit drug Balmora Blue in the whole of Tamriel. Sabine lives a comfortable existence aboard the Red Wave, spending most of her time wandering around the ship and conversing with her fellow pirates. At 8pm, she finds a bed and sleeps a solid 12 hours until 8am. During the related quest she moves outside and guards the deck at all times. "You reek. A little friendly advice - take a bath and get some new clothes." "Whatever you're about to say, don't bother. I don't want to hear it." "Out of my way, or I'll cut you. Deep"
Erikur will point you in Sabine's direction in order to acquire a particular drug: "You'll need to get your hands on some Balmora Blue from Sabine Nyette down by the docks. She's the first mate on another ship, the Red Wave." True enough, she is willing to sell the drug to you when you approach her: "Well then, you're talking to the right person. I'm the only one left in Tamriel that can get my hands on it. It's damn near impossible to find anymore. You want to buy it off of me?" If you complain about the price she'll be unmoved: "I'm sorry you feel my illegal contraband is overpriced, perhaps you should bring it up at the next merchant guild meeting. Look, you want it, I got it. You know the price, so talk to me when you want to cough up the gold." Trying to work your way around the issue won't help either: "I'm afraid not. How else can a poor, overworked sailor like myself expect to earn a living?" Your only option, apart from outright theft, is to pay up. If you're rich enough to have 1500 gold she'll be pleased: "Good. Here, take this key. The Balmora Blue is locked in a chest under the docks near the Red Wave. Hope you like getting wet." Otherwise she'll be irritated: "Sorry, guess it's too rich for your blood. Come back when you find the coin." Sabine wears a set of steel plate armor with matching gauntlets and boots. She carries the key to the chest containing the Balmora Blue along with a selection of common loot and gold. In combat, she relies on a leveled battleaxe of the best possible quality. This page was last modified on 2 August 2015, at 05:11.